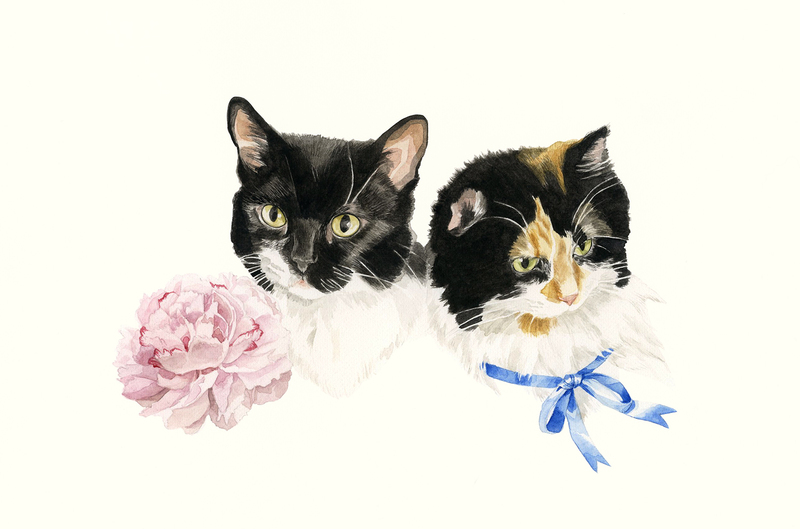 I don’t mean to single out one wedding gift over another, because the generosity of our friends left me completely stunned, but I wanted to share this one here because I think it is one that a lot of you will appreciate: an original watercolour of Oreo and Pony by Melinda Josie, expertly framed by her husband Chris. When I unwrapped it, I sat in shock for a good two minutes. It is just incredible, especially in person (click it to view it large). My baaaaaaaabiessss! ETA: Melinda posted about the painting on her blog! 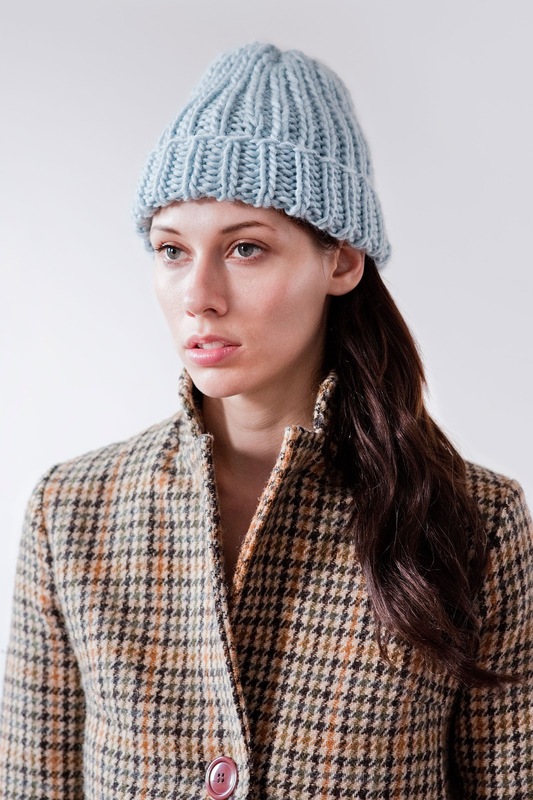 I am continuously in awe of Tara-Lynn and the beautiful & soft knits she produces for Good Night, Day. I have a few of her pieces already and adore them, as I have mentioned before. She has been a busy little bee getting ready for fall and I wanted to share her new lookbook, modelled by Kate Campbell and shot by Lauren Glegg. This season I continued with my Good Night, Day theme of referencing the past, while maintaining the modern and minimalist designs. The pieces were created with traditional knits in mind, while using pure wools that are drastically thick and thin spun and new blended ultra-soft fibers (cashmere/silk/merino wool blends) and completed with bold colour blocking. This season’s designs also incorporate varied knitting techniques such as reversible chunky cables, subtle dip dying effects, every which way fringe details, mobius ribbingand lattice work to name a few. All her pieces are created with fair trade alpaca, merino, and cashmere wools. Tara-Lynn has generously created the coupon code FIELDGUIDED for 10% off items in her shop. Also, check out the Simcoe braided headband (which I have, and adore) in Vogue Germany, fourth photo down. Pretty cool. I just wanted to say thank you for your sweet comments on my last post! I hope to share a few more photos at some point, but for now I am still quite overwhelmed with it all. Thank you, thank you! ...and I couldn’t be happier with how the day went (this is just a quick snap from my phone, which has already been posted to Instagram). It was a fairly wedding-y wedding, traditional and large and decidedly not the small picnic we had intended to have years ago, and I loved it. It was totally worth not eating in restaurants for nearly a whole year and giving up lots of other things to save up for it! Plus it was really incredible to be surrounded by so many people I love all day. Just so much love. 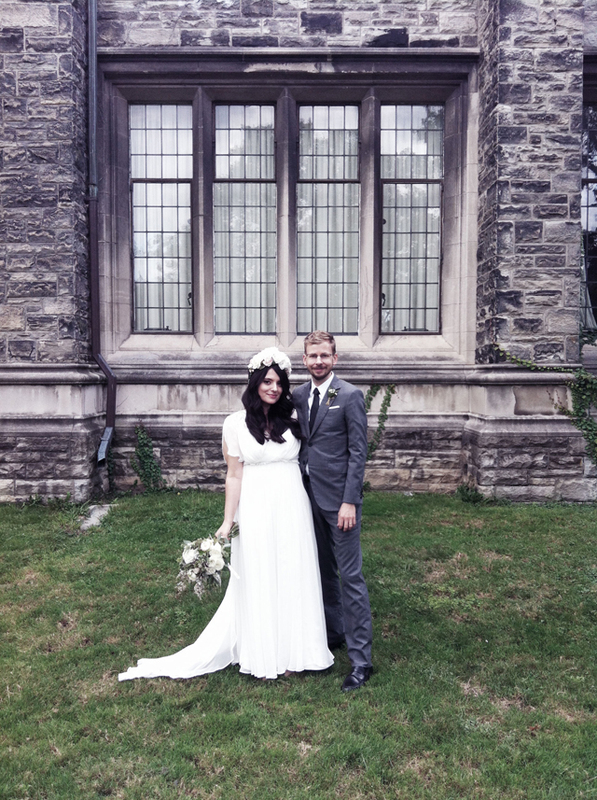 My dress was designed by my friend Kristiann of Victory Patterns (you may also know her from workshops at The Workroom), and all 15 yards of silk chiffon + vintage beaded appliques were sewn by her. The back is my favourite part of it, so beautifully draped. I wore See by Chloe sandals and was comfortable all day long. My headpiece was a custom creation from Lou Lou Loves You. It isn’t too visible here, but it has white and pale pink roses throughout and ties in the back. I have to admit that I nearly chickened out of wearing it because it is such a statement! But I loved wearing it and I got so many compliments. A little girl at the wedding pulled roses out of the centrepieces and put them in her hair because she wanted to look like me. I wore a pretty Twigs and Honey veil for the ceremony, though. Geoff’s suit was custom made for him by Brooklyn Tailors, and it too was perfect. I highly recommend their suits, especially if you’re looking for a slim cut, modern suit. Daniel and Brenna are the kindest people; I hope we can meet them when we visit New York (which should be soon)! Geoff has never owned such a nice suit and we know he will get years of use out of this one. His shoes are Brooks Brothers and his tie is J. Crew Factory. I made the little pocket square. I had started to make the ties, but it was too time consuming, and the Factory ties were silk and only about $10. So yeah. The flowers (bouquets, boutonnieres, centrepieces, etc.) were done by Alison at Coriander Girl. I trusted Alison completely, let her do her thing, and she went above and beyond with the flowers, which were one of the parts I cared about the most. I cried when I saw them, for real. My hair was done by Ana Sorys and my makeup by Mary at Eye Love. I was thrilled with everything they did, and they are both so lovely. Everyone was so lovely! Our photos were by Celine Kim, and this is probably the first time in my life that I am excited to look at pictures of myself! The cake was by Nikole Herriott, and it was so beautiful. So so beautiful (of course). One last shout-out goes to our DJ, Justin from Indie Wedding DJ. Having a super fun dance party was really important to us, and we didn’t trust ourselves with an iPod playlist, equipment set up, etc. Justin was amazing (I really appreciated it when he would mix out songs that I had insisted he play that just were not working). Our friends who remained past 1AM booed when he had to stop playing. I made an 8tracks mix with some of the songs he played during dinner and for dancing. The first track was our first dance, chosen for prettiness/sentiment/short length/my history with it (I have loved Mojave 3 since they were Slowdive in the 1990s). I guess I am married now! It doesn’t feel real yet. I love you, Geoff!